One way to Boost Your Bing Ads Performance & Click Through Rates is by grabbing attention of your visitors and converting them into customers. You can do this with the help of ‘Bing Ad Extensions’ pretty easily, by show casing the amount of Authority and amount/variance of information/services/products you have. When you use regular Ads just like any other SEM specialist, you will end up getting normal results just like them. In fact, you are even limited on the ability to provide what you have to offer with your products/services. With the normal Ad description & titles, you get very less amount of Ad space even if you are ranking high or even if you are the only to be shown there. When competing with others, it is most important for your ad to stand out. Is it just the Ad copy? or is there any thing else that you can do? Keep reading to know How Bing Ad Extensions can help you in making your Ad stand out the crowd and help increase CTR and in-turn Conversions. By using these Ad Extensions, you will not only be able to gain more On Screen presence, but also exhibit your authority in your Ad and able to provide more information to your visitors even before they get into your website. You can ensure that you give more options to the searchers to click on your ad and get into your website. By properly Tracking your Bing Ads campaigns for conversions, you can even maximize your profits & reduced losses. There are actually 10 Different Types of Ad Extensions that we can use (as on the date this article is being written). We have tried and tested a few of the Ad Extensions and we will go over each of them in this post. 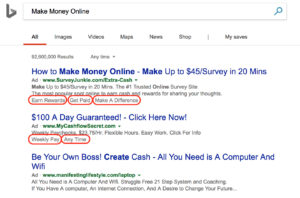 While you can find generic information about these across the internet, we will see how this can even help you in promoting Affiliate Offers from networks like Clickbank/Peerfly on Bing Ads. Click on ‘All Campaigns‘ from the left side pane. Click on ‘Ad Extensions‘ when you are on the ‘All Campaigns‘ view. Choose the ‘View‘ you would like to Add or View. (See the screenshot above). When you scroll down a little bit, you will see another button ‘+ Add new <ViewType> Extension‘. You will be prompted with a Pop-Up to add all the relevant details based on the type you choose. One of the Best Ways to expose Multiple Links/Pages/Services/Products of your website with in the same Ad with No Extra Cost. This is one of the few extensions that can direct your visitors to the exact page right from the search results. All you need to do is, setup different pages or posts with in your website and add them during your Campaign creation. Here is a sample of ‘Sitelink Extension’ from the Bing Search Results. Observe how the extra links are appearing below each ad. We have tried this with one of the Top Clickbank Offer – “Ted’s WoodWorking Plans”. On a regular $5 day test campaign, we observed good CTR, with no extra keywords or work other than creating and adding Sitelink Extensions. We even observed a couple of ‘Server Calls’ on our Clickbank report, which means, someone tried to purchase this product, but backed out on the Billing Page. The way we implemented this is by just creating a website & created a few Landing Pages directing to different offers from the same WoodWorking niche. If you would like to know in depth details feel free to ask us. Performance of these reports can easily be obtained from the Reports section. By running ‘Ad Extension By Keyword‘ report. You can even see how many times a Sitelink Extension has been shown & clicked at each keyword level. Here are quick results from one of our test campaigns. Which means, 18% of Searchers have clicked on Sitelinks while rest of them clicked on Ad Titles. (Some of these people might have clicked on Both though). If you setup Conversions appropriately in your campaigns, you can make best of use of these kind of extensions and grand more targeted traffic as well. Oh, before i move on to next one, let me tell you that you can add upto 20 of these per Campaign or Ad Group. These are like Advanced version of Regular Sitelink Extensions. The basic difference between these both is that, you get to add 2 Lines of more description to each of your extensions. This addition will help you in being able to grab more space in the search results, which in turn help you grabbing more attention from your visitors. It also helps in conveying the message more clearly than regular extensions. Check out the example below where you can see more information about each of them. The way you add these, is same as how you add your regular site extensions. As part of the addition, you would make sure that you update the ‘Description‘ field to ensure you get the extra 2 lines displayed. While it is not guaranteed to have these extensions show up every time your Ad is served, it does help when possible. Especially, the Enhanced Sitelinks would be shown only when the Ad is being served at the Top 1 position in the results. But, it really doesn’t hurt to add the descriptions in anyway. 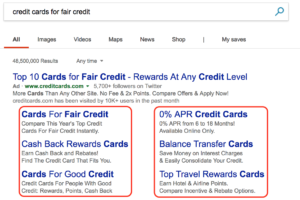 When you end up finding and adding a Ton of Keywords in your campaigns, your ad end up showing on the top position for some keywords, if not for all. (depending on your Bid Rates & Ad Quality though). One bad thing with this type of extension is that, there is no way to see how many times our Ad is served with Enhanced Vs Regular sitelinks. The ‘Ad Extensions Reports’ will not distinguish between both at the moment. These can also be added at all 3 levels (Account, Campaign Ad Group). These are another variant of Ad Extensions and Very Easy to add. Also, they can be used by almost any type of PPC marketers. Call Out Extensions are typically a short snippet of texts that appear just below your main ad. You can use them to promote different flavors or variants or products with in the same ad. Check out this screenshot for an example of how this ad would like. Observe that the text is not clickable unlike the one’s we discussed above. You can add these from the same location as we add other Ad Extensions. But, we need to have a minimum of 2 CallOuts to begin with and a max of 20 per Campaign or Ad Group. These generally appear only the Mainline Ads and not the Side Bar ads which are anyway going to paused by Bing pretty soon. You can add many callouts as possible at campaign level and can use only the ones which you need at individual Ad group level. Performance of these extensions is typically not possible to track in a direct way, as they don’t get you any clicks. But, we can see how many times each of these snippets are shown when our ads are served. Check out this example in the screenshot below. Above screenshot is an Excel version of the ‘Ad Extension Details’ Report. Observe the columns ‘Impressions‘ – Give you number of times a particular callout appeared & ‘Ad Extension Property Name‘ – Gives you the actual callout appeared each time. One good thing with this type is that, they can be used along with other Ad Extensions as well. If you are using doing Direct Linking of Clickbank Offers on Bing Ads, this is one of the Extensions that you can use very comfortably. Relatively similar to Callout Extensions, but this type of Extension actually helps you to promote different variants of your products with in a context, unlike callouts which can be generic. They are also very easy to add just like the other ones. But, we do have a limitation on the contexts that we can add and they are defined by Bing. Here is a snapshot of the contexts and the way to add a Structured Snippet Ad Extension. Observe the list of Headers you can add if you wish to use this extension. We can add these extensions along with other extensions. But, Bing might or not show these values based on different factors including the screen size. There is a minimum of 3 values to be used whenever we add them to our campaigns or ad groups. Here is an example of an Ad with these extensions in usage. Observe that the Ad in the above screenshot is using the Header – ‘Types‘ to promote different variants of the plans they have. We used ‘Models‘ in our Test Campaign. Since these are Non Clickable snippets, there is not a direct way to track the performance of these ads. However, we can run the ‘Ad Extension Details‘ report to understand how many times a particular Header is shown. Here is a sample of the Report which shows that information. Observe the column ‘Impressions‘ to know ‘How many times a particular Header list is displayed’ along with the Ad. If you would like to take a look at the details in live. Check out this video below from our Channel. While above are the Ad Extensions are the ones, we tried & implemented in our campaigns, below are a few more that are available on Bing Ads. Image Extensions – Provides an ability to include an Image along with your Ad. Location Extensions – Provides an ability to display the address of your business location closest to the customer. Call Extensions – Allows your customers to view the phone number. This can be different from the one that you could use in Location Extensions. Review Extensions – You can add link to a page or website where you got a review or testimonial of your website. App Extensions – Additional elements of your ad that promote your iOS, Android and Window apps across PC, tablet and smartphones from your ad. Price Extensions – This is a brand new extension and is available only for few customers. This will allow you to show different variants of your products with a Link to the respective page. Can track the results using the Reports. You can create Account Level extensions & chose whatever is applicable to your individual Ad Groups. You can control when to show them and when to stop them. They are available on Mobile as well. You can customize the Details based on your remarketing aspects. This way, you can convey targeted messages to your customers. You cannot preview them while creating the campaigns. Not all of them can be tracked precisely. If you don’t use them right, you end showing unwanted information to your visitors. There are 4 Different Types of Ad Extensions Reports that you can use to track and see how these extensions are working. 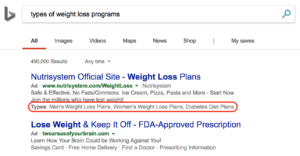 Ad extension by keyword – Can help us understand how different click types are performing for each keyword when different ad extensions are shown in the ad. 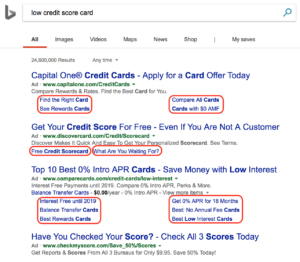 Ad extension by ad – Can help us understand how different click types are performing for each ad when the ad is served with different ad extensions. 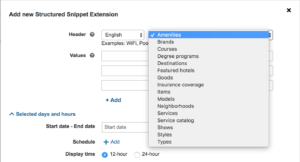 Ad extension details – Can help us understand how different ad extension properties are performing when different ad extensions are shown in the ad. Call forwarding detail – understand how the accounts, campaigns, or ad groups are performing with call extensions. You can run these reports or download them on demand very easily and analyze your campaigns accordingly. If you prefer to reading an article over an hour long webinar, check out the Bing Resources link. So…. Do you agree that these Ad Extensions will help you to Boost Your Bing Ads Performance? What do you think about using Ad Extensions in your campaigns?